Barrel: Chrome-moly vanadium steel barrel chambered in 5.56 NATO, with a 1:7 twist rate, M4 barrel extension, and a carbine-length gas system. M4 profile barrel is finished off with a 15” PSA M-Lok free-float handguard, low-profile gas block, and A2 flash hider. Bolt Carrier Group: Full-auto profile bolt carrier group. Shot-peened, mil-spec Carpenter 158 steel bolt. Gas Key Hardened to USGI Specifications, fastened with Grade 8 screws, and Staked Per Mil-Spec. Carrier is 8620 steel M-16 full auto profile and is chrome lined and phosphate coated. Lower: These forged lowers are quality made using 7075-T6 aluminum and are marked "MULTI" for the caliber. Finish is hard-coat anodized. The Mil-spec diameter 7075-T6 buffer tube is hard-coat anodized, has 6 adjustment positions, and is fitted with a PSA Classic Carbine Stock for a traditional AR-15 look and feel. The rifle is finished off with a PSA Classic A2 grip, and standard Mil-Spec AR-15 Fire Control Group. BEST ANSWER: I just ordered mind Thursday. I hope you were able to order one as well! How long does it take to ship to Florida? BEST ANSWER: I ordered mine on Dec 31 late at night, picked it up yesterday. BEST ANSWER: Yes, it will shoot both. Can this be shipped to Texas ? BEST ANSWER: Yes, I've had PSA shipped to my FFL many times. Can this be sent to CA? Can this rifle be shipped to Indiana? Does it come with the iron sights? Does this have a lower rail system for a vert grip? BEST ANSWER: No. You can get it cerakoted or what not. The color isnt paint, it is anodizing. Can you buy this at age 18 in South Carolina? What optics fit this well? Does this come with sights included? Can you ship this to Maryland? Anyone know how many pounds the trigger pull is? Will this rifle take a LaRue tactical MBT-2S replacement trigger? Is this a chrome lined barrel? BEST ANSWER: This is a non chrome lined barrel. Also, the Nitride barrel finish pertains to the outside of the barrel and not its' interior. I was pleasantly surprised by the quality of this rifle. The fit and finish was good, and so far, it has performed flawlessly. Purchased Federal 'Freedom Fuel' ammo and have had ZERO problems after approximately 800 rounds Each round cycled, fired, and extracted w/o issue. First 150 rounds were used with iron sights, then installed a Vortex scope. Rifle shoots tight and consistent groups. The only item that has been replaced is the stock. Not a fan of the Magpul, installed a MFT Minimalist. Rifle was packaged well, shipped quickly, and arrived in a discreet box. Will definitely continue to do business with Palmetto State Armory. This is my first AR 15 and I very happy with it. I've shot several rounds through it and it has performed well. I look forward to hunting varmint with it which right now will be its primary purpose. I do recommend this PSA AR 15. Rifle had to be shimmed on forward takedown lug with .008” shim or it would wobble side to side. The forward assist was installed incorrectly and bent in the process. Terrible quality control, I expected more from PSA. Maybe their higher end stuff is ok, but I’d stay away from the lower priced rifles. By far the best quality AR15 for under $500. You won't find another gun with equal quality that comes with a free float hand guard. My first firearm purchase from PSA and I'm pleased to say the least. Very happy with my new weapon. My wife had me order this for myself for Christmas. It’s the first AR style rifle I have owned, and I was very happy with the purchase. 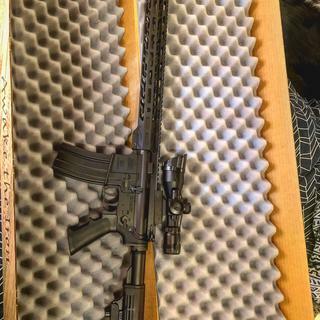 Well worth the money and for a mil-spec rifle I was extremely impressed in the quality. My first purchase from Palmetto state Armory and because I was so happy I will be making more purchases from PSA in the future.